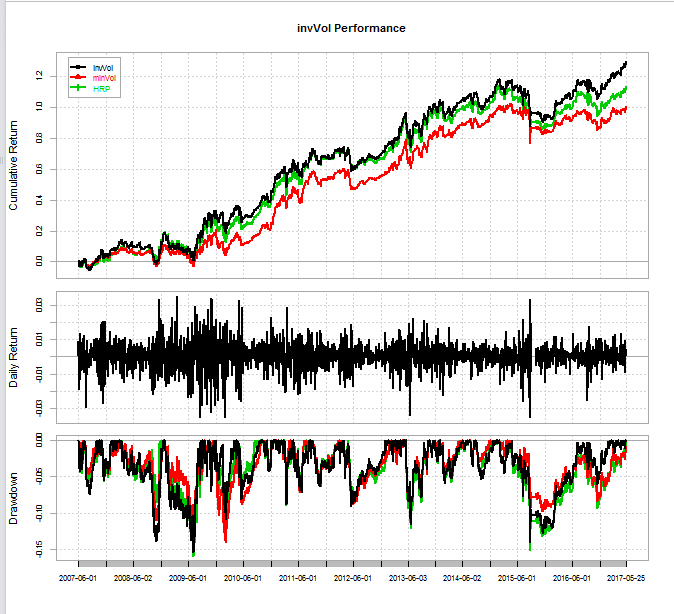 This post will be about comparing strategies from the paper “Easy Volatility Investing”, along with a demonstration of R’s table.Drawdowns command. First off, before going further, while I think the execution assumptions found in EVI don’t lend the strategies well to actual live trading (although their risk/reward tradeoffs also leave a lot of room for improvement), I think these strategies are great as benchmarks. So, some time ago, I did an out-of-sample test for one of the strategies found in EVI, which can be found here. Using the same source of data, I also obtained data for SPY (though, again, AlphaVantage can also provide this service for free for those that don’t use Quandl). So, an explanation: there are four return streams here–buy and hold XIV, the DDN momentum from a previous post, and two other strategies. The simpler one, called the VRatio is simply the ratio of the VIX over the VXV. Near the close, check this quantity. If this is less than one, buy XIV, otherwise, buy VXX. The other one, called the Volatility Risk Premium strategy (or VRP for short), compares the 10 day historical volatility (that is, the annualized running ten day standard deviation) of the S&P 500, subtracts it from the VIX, and takes a 5 day moving average of that. Near the close, when that’s above zero (that is, VIX is higher than historical volatility), go long XIV, otherwise, go long VXX. Again, all of these strategies are effectively “observe near/at the close, buy at the close”, so are useful for demonstration purposes, though not for implementation purposes on any large account without incurring market impact. To note, both the momentum and the VRP strategy underperform buying and holding XIV since 2011. The VRatio strategy, on the other hand, does outperform. Here’s a summary statistics function that compiles some top-level performance metrics. Note that the table.Drawdowns command only examines one return stream at a time. Furthermore, the top argument specifies how many drawdowns to look at, sorted by greatest drawdown first. One reason I think that these strategies seem to suffer the drawdowns they do is that they’re either all-in on one asset, or its exact opposite, with no room for error. NOTE: I am currently looking for networking and full-time opportunities related to my skill set. My LinkedIn profile can be found here. Leverage Up When You’re Down? This post will investigate the idea of reducing leverage when drawdowns are small, and increasing leverage as losses accumulate. It’s based on the idea that whatever goes up must come down, and whatever comes down generally goes back up. I originally came across this idea from this blog post. One: the default leverage (that is, when your drawdown is zero, what’s your exposure)? For reference, in the original post, it’s 10%. Next: the various leverage levels. In the original post, the leverage levels are 25%, 50%, and 100%. And lastly, we need the corresponding thresholds at which to apply those leverage levels. In the original post, those levels are 20%, 40%, and 55%. So, now we can create a function to implement that in R. The idea being that we have R compute the drawdowns, and then use that information to determine leverage levels as precisely and frequently as possible. So, let’s replicate some results. That said, what would happen if one were to extend the data for all available XIV data? 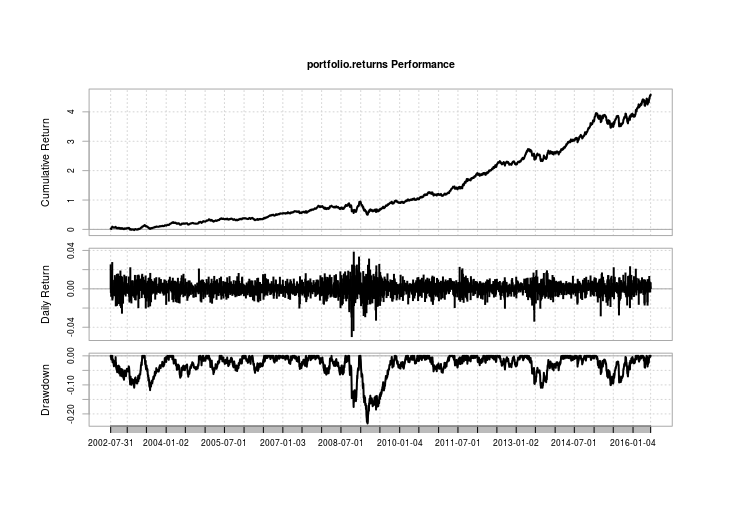 In this case, I think the takeaway is that such a mechanism does well when the drawdowns for the benchmark in question occur sharply, so that the lower exposure protects from those sharp drawdowns, and then the benchmark spends much of the time in a recovery mode, so that the increased exposure has time to earn outsized returns, and then draws down again. When the benchmark continues to see drawdowns after maximum leverage is reached, or continues to perform well when not in drawdown, such a mechanism falls behind quickly. As always, there is no free lunch when it comes to drawdowns, as trying to lower exposure in preparation for a correction will necessarily mean forfeiting a painful amount of upside in the good times, at least as presented in the original post. NOTE: I am currently looking for my next full-time opportunity, preferably in New York City or Philadelphia relating to the skills I have demonstrated on this blog. My LinkedIn profile can be found here. If you know of such opportunities, do not hesitate to reach out to me.